Reminder: Newly installed floors should not be wet cleaned within 3 days of installation. What cleaning detergent do you recommend ? Forbo flooring has a strong protective finish that makes cleaning & maintenance very simple. 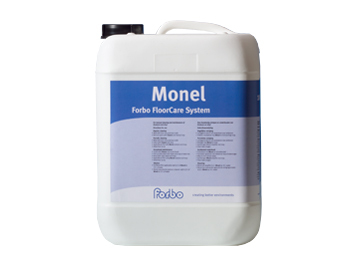 We highly recommend Forbo's monel cleaning agent. With regular use of Monel the original appearance of the floor is retained. Forbo monel is specially designed for Marmoleum and Forbo Cushioned flooring. If alternative products may be used as long it's pH neutral, however, please consult with your regular supplier if unsure for more information and guidance. How often do i have to clean Forbo floors? Is it near an entrance to the building or on an upper floor? Will it collect dry or moist soil? What level of traffic will it be subjected to? Remember that light and uni-colours may need to be cleaned more frequently. Also, did you know that Forbo's Coral entrance flooring system is independently proven to remove and retain up to 94% of all dirt and moisture entering a building by foot traffic? Forbo recommends installing an entrance system ideally more than 6lm and quality should be used. Which colour pads can i use for buffing linoleum or vinyl floors? Can I polish or seal the floor? No, Forbo flooring have a strong protective finish. Especially for forbo's step safety vinyl collection. The use of polish and sealant as slip resistant properties of Step could be reduced. How do I get rid of stains on Flotex Flocked Flooring? Flotex® do not trap particles of soil, allowing them to be removed without difficulty during cleaning. Most spills can be cleaned with plain water. it is also 100% waterproof. Most spills will respond to the use of clean warm water, or the use of a neutral, non-foaming, carpet detergent. Where required for heavier or stubborn spills, the scrape scrub, rinse procedure below may be used. How Do I Clean Marmoleum flooring ? factory finish which should not be removed. The Topshield2 finish is part of the linoleum and the perfect base for your ongoing use of the floor. What do I use to clean Safestep R12 flooring ? Manual Option: We recommend using a scrubbing brush such as nylon, bassanite. For larger areas: We recommend using either a scrubber drier or rotary machine (150-180 rpm) with a suitable brush* or a cylindrical brush machine cleaner.